Mediastinum - space in the chest cavity, limited front of the chest, behind the breast Department of spine and tails edges, bottom - aperture; the top border of the mediastinum conditionally consider horizontal line at the top of the sternum; at the top of the mediastinum reported with fiber spaces of the neck. The sides of the mediastinum are limited and several sheets of the pleura. In the mediastinum are vital organs, surrounded by tissue. 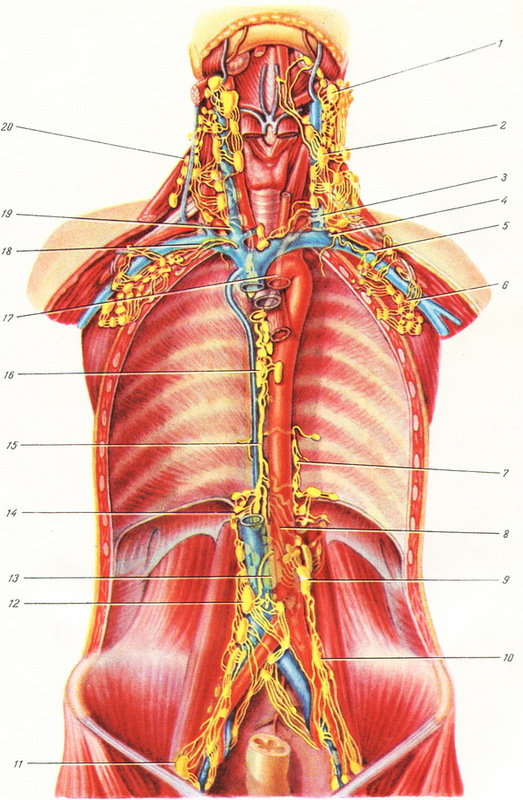 Vertical plane, carried out through the root of the lung, mediastinum is divided into two sections: the front containing heart with okoloserdecna bag, large vessels, thymus or its remains, phrenic nerves, and back - thoracic esophagus, the aorta with its branches, thoracic lymphatic duct, Vienna, sympathetic and wandering nerves. Pathological processes developing in the mediastinum, are very dangerous for the patient because it affects and prisoners in the mediastinum vital organs. Closed injuries of the mediastinum are most likely to arise when injuries or compression of the chest; they are accompanied by hemorrhage and education mediastinal emphysema. The latter occurs when you break the lung tissue and bronchi or esophagus. The inflammatory process in fiber mediastinum - mediastina - flows is extremely hard and is accompanied by high rates of mortality. Causes of mediastinitis can be penetrating wounds of the mediastinum, the damage to the esophagus (for example, foreign body, or when ezofagoskopia), the spread purulent process of cellular tissue areas neck (zapotocny abscess, phlegmon of floor of mouth and other)operations on the esophagus. The surgical treatment of a massive antibiotic therapy. From benign tumors of the mediastinum meet different kinds of cysts, teratoid tumors, thymoma, neurinomas, lipoma, retrosternal goiter. These tumors can occur from embryonic remnants of some organs (thymus). Primary malignant tumors of the mediastinum are chlamydia (see) and lymphosarcoma (see Retikulosarkoma). Secondary malignant tumors of the mediastinum are more common than primary. These include the metastasis of lung cancer, breast cancer, thyroid cancer, and others). Treatment of tumors of the mediastinum surgery, radiotherapy and chemotherapy. Topography of thoracic duct: 1 - lymphonodus jugulodigastricus; 2 - lymphonodus juguloomohyoideus; 3 - the mouth of the thoracic duct and truncus jugularis sin. ; 4 - the mouth of the thoracic duct and truncus subclavius sin. ; 5 - truncus subclavius sin. ; 6 - lymphonodi axillares; 7 - left okoloserdecna collateral to the thoracic duct; 8 - plexus flowing into the thoracic duct passing vessels left lumbar lymph nodes; 9 - lymphonodi lumbales sin. ; 10 - lymphonodi iliaci; 11 - lymphonodus iliacus (supra-femoralis lat. ); 12 - lymphonodi lumbales dext. ; 13 - cisterna chyli; 14 - the right transdiafragmal collateral to the beginning of the thoracic duct; 15 - interactivointernet part of the thoracic duct; 16 - lymph nodes thoracic duct; 17 - supra-aortic part of the thoracic duct; 18 - truncus subclavius dext. ; 19 - truncus jugularis dext. ; 20 - lymphonodi cervicales lat. (chain along the n. accessorius).